· Four main business operated by MITRA, that are Construction, Property Development, Healthcare and Quarry Operations. · In Malaysia, the Group is principally involved in the civil engineering, building and road construction works and property development. · In South Africa, the Group is principally involved in civil engineering, construction works, property development and golf management. 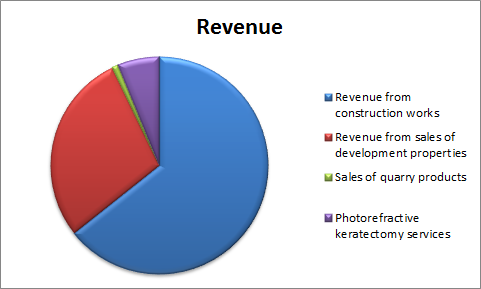 Its revenue seizes 4.3% of total revenue in 2014. · Accounting based earning valuation model giving intrinsic value on MITRA with RM2.29. · DCF Model giving intrinsic value with RM2.95. · Gross profit margin maintained at good % with 20+. · ROE is uptrend from year 2012 to 2014. It achieves 13.61% in 2014. · Profit margin is uptrend condition too from year 2012 to 2014. Last profit margin is 10.34%. · At current price, PE is 12.68 and need achieve growth rate with 32.7% on EPS to make PE 10. · Latest borrowing of Q1''2015 is RM 0.35 per share while cash per share is RM 0.02. So result net debt of RM 0.33 per share. Net debt may show company unhealthy in cash. · Average free cash flow yield, CY is 4%; it just hit my minimum criteria on CY. · DY may higher than the yield by putting fixed deposit in bank. It hit 5% last year. · Rocket trend in trade receivable by RM 60 million or 49%. But just RM 6 million or 5.43% increase in trade payable. · MITRA maybe give up the quarry division due to its revenue decreasing and its finished good inventory is zero during year 2014. · MITRA is giving up its Healthcare division by announcement on 15/4/2015 that intention to dispose all its 51% shareholding in Optimax Eye Specialist Centre Sdn Bhd. · MITRA’s ROE currently is 7th highest in Construction Sector. · MITRA’s price CAGR along year 2010 till today recorded 7.57%. 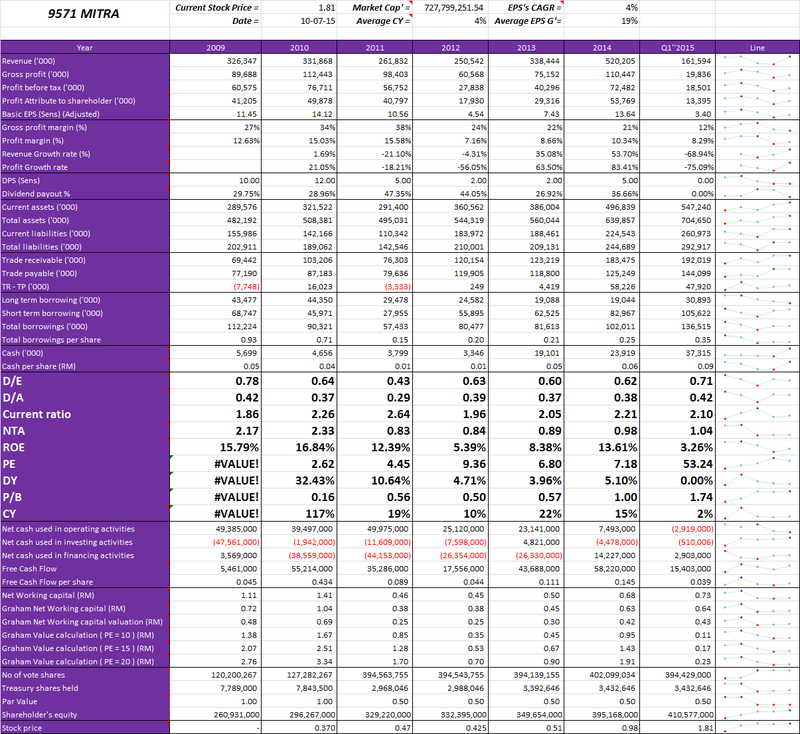 · MITRA going get away from Healthcare and Quarry division, both these combined contributed 5.45% of total revenue last year. It just small part to MITRA. · Latest treasury shares amounted to 2,357,446. · Form 28A and 28B mean Notice Of Shares Buy Back By A Company and Notice of Sale or Cancellation of Treasury Shares respectively. · MITRA sold 1,010,200 treasury shares in year 2015. Its activity starts from 26/6/2015 to 6/7/2015. · CEO, Tan Eng Piow holding 40.48% shareholding in end of April 2014. · EPF is 2nd biggest shareholders with holding 2.23%. · Proposed bonus issue on the basic of 1 for 2 existing ordinary shares. · Proposed free warrant issue on the basic of 1 for 5 existing ordinary shares. · Those proposed subject's ex-date is 17/8/2015. · Annual report 2014 mentioned Malaysia's construction industry expected significant growth at 10.7% in 2015. · MITRA's construction activities strong backed by mega highways, rail-lines and affordable housing projects in Klang Valley and Putrajaya. Its unbilled sales boosted RM 1.88 billion. 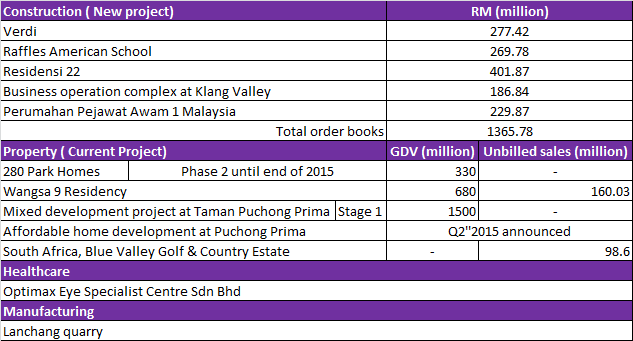 · Wangsa 9 Residency project which launch since mid-2014 recorded unbilled sales of RM 156.75 million. Gross development value of this project estimated RM 680 million and expected contribute earning to Group from 2015 until completion of project in 2018. · Proposed mixed development project and affordable home project at Puchong Prima with combined gross development value of RM 1.57 billion. · From pie chart above, we can clearly see that primary business is Construction and secondary is Properties. · Cleary view of diminishing performance on property development. · Construction, Investment in South Africa and Healthcare make an attractive record. Healthcare's result mainly due to disposal gain of office building with amount of RM 650,000. · Increased in revenue by RM 57 million or 55% compared Q1''2014. · Profit before tax is increasing RM 4 million or 29% compared Q1''2014. · Net profit is increasing RM 3 million or 26% compared Q1''2014. 1. Why worst result from year 2011 to 2012. 2. Why positive result on investing cash flow in year 2013. 3. Why positive result on financing cash flow in year 2014 and Q1''2015. 4. Why negative result on operating cash flow in Q1''2015. 5. What are latest unbilled sales of MITRA. 1. Director explained it as reduced contribution from both the construction and local property development divisions. 2. Mainly due to disposed 6 million ordinary shares in Rawang Specialist Hospital for cash RM 10,126,032 to Kumpulan Perubatan Johor. 3. In year 2014, due to RM 18 million and RM 10 million of banker acceptance and short term revolving credit respectively. 4. Because inventories increased with amount of RM 35 million in Q1''2015. 5. RM 1.75 billion outstanding order book in end of Q1''2015. Thank you very much for such a clear and concise report...give you a LIKE.